he Blue Bird BMS-115HV is a the horizonal lug/wingservo verson of the highest torque servo in the very highly regarded Blue Bird BMS-105HV/106HV/107HV range of 10g servos. At 8.4V the BMS-115HV's torque is 5.3 kg.cm while still having an excellent speed of 0.09 seconds per 60° of movement. The Blue Bird BMS-115HV is a great HV servo built to the same space saving form factor as the MKS HV6110. It is similarly precise, with no free play in the geartrain, and it is even more powerful and faster than the competing product. The large output spline is identical to Futaba 25 tooth splines, so replacement output arms are readily available. Note the output spline is not the same as MKS so the servo cannot be used with most MKS accesories. HyperFlight is pleased to be able to supply the complete range of this excellent and increasingly popular range of Blue Bird servos. Many expert modellers are fitting these servos to the latest ultralight F5J models like the Ultima and the Infinity. 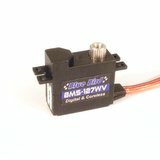 We're pleased you would like to review Blue Bird BMS-115HV Servo - 10.2Kg.cm 0.10s 21.0g 13mm. Used these servos in my 4m Compact Pulsar and re-ordered these extras. Powerful output from a tiny servo. Excellent service as usual. I ordered 4 x 115HV's and 2 x 105HV's having already ordered exactly the same items a few weeks earlier. The size and weight are such that I think I will be using this setup as a default in most of my (non-competition) sport gliders. Quick shipping as usual. Good service as usual from the team. I have not installed and used these yet, but they are certainly of a size that would fit a wide range of models.